This 7-inch heavy duty monitor has a very bright display which makes it perfect for daytime viewing of your hitch, goose neck or fifth wheel. The vivid colors help you not only see what’s going on behind you but you won’t miss any details. This monitor is very simple to install, all you need to do is connect the monitor it to a cigarette adapter or connect the pigtails to any 12-24 volt source. The digital receiver is built into the monitor so there is nothing to do other than connecting the system to power. The monitor includes a commercial grade dash mount or you can add the optional suction cup mount. Keep in mind that while this monitor is commercial grade and heavy duty it is very lite so mounting on a windshield is very easy. If you plan to use the magnetic base digital backup camera on a forklift or bobcat the included stand allows you to even hand it from your roof and point the monitor down. 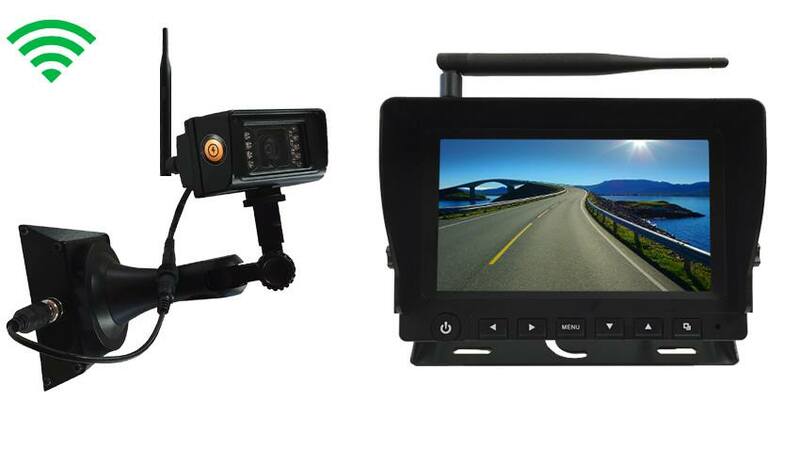 This is the perfect wireless, hitch, battery powered, wireless backup camera and monitor system for those that want a simple, reliable and swift hitch experience. The magnetically based, battery power rearview camera is perfect for those people who want to take their camera, pop it in the back of their truck and connect their goose neck or horse trailer. when buying a swift hitch type of backup system you were limited to a few minutes of battery life that you rarely could charge with a limited 10-13 foot range. With this TadiBrothers designed & manufactured rearview camera we guarantee you 18 hours of viewing time with a wireless range of 150ft. This is truly the best portable backup camera we have ever made, Every part of this system is made with heavy duty and commercial grade parts, the magnet can hold even 5 cameras and the battery if meant be viable to 5 years with a 90% capacity. If all you did was use it a few minutes here and there it could be months before you even charge it but the camera does include both a car charger and regular wall outlet charger. We have tested it over 1000s of hours of use with forklifts here in our own warehouse. Like all our back up cameras, this too has the best military night vision in the market. If you are using it day or night, the high definition image will always look crisp and the TV in your home. Because this is a commercial grade backup camera its IP rating is IP69, this means that you can fully submerge the camera in sea water and it will work flawlessly, this camera is 100% water and weather proof, this makes it very appealing to people who need to hitch their boats or dismount them in the water. This portable Digital Wireless Rear View Camera System has a flawless range of 150ft+ (when we tested it in open space we have seen a range of 215ft). This Digital camera is compatible with any of our digital monitor. It is 100% weather, water, and mud proof. It is extremely durable and has been tested and consistently used in the harshest environments. How does this Hitch camera system work? Simple!